There are a lot of edibles that can be taken up a notch with some beautiful, colored sugars. These sugars are readily available in a lot of baking supply stores but can be up to $1 an ounce! Of SUGAR!? So for years, I’ve been making my own colored sugars. You can see them at work in my Minecraft Marshmallow Creepers and my Halloween Cupcakes. 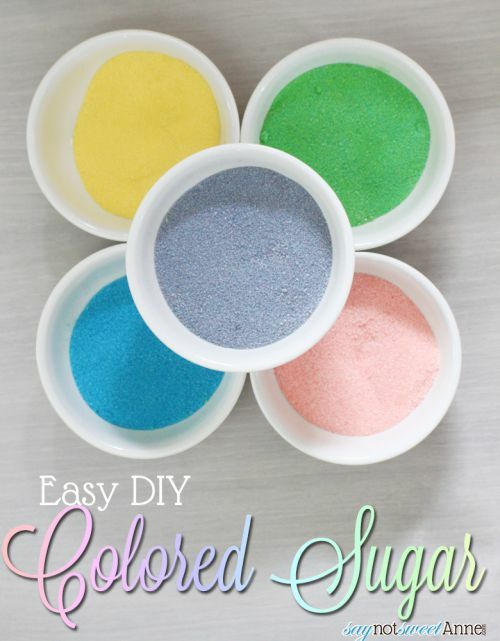 How to make colored sugar is touched on in those posts, but I decided that it deserved its own post, so you can tuck it away in your bookmarks until needed. You see, the possibilities are endless! If you’re like me, once you make a color or two, you’ll find yourself making TONS of them! You can’t have too many colors of sugar…. right? Food coloring. Liquid is easiest, but I’ve been known to use frosting gel colors in a pinch. Oven and shallow metal pan (optional). This is the sort of thing that I’m sure there are a lot of variations of. But here is how I make mine. Place 1/4 cup of sugar in the bowl of your mixer. Add 4-6 drops of food coloring. 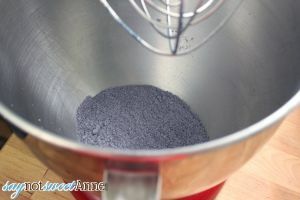 Mix with the whisk attachment until the color is even. 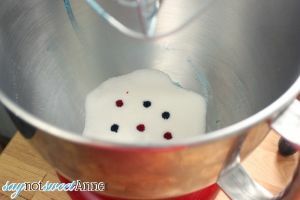 If there are a few clumps of color, use the back of a spoon to crush them up, then whisk again. 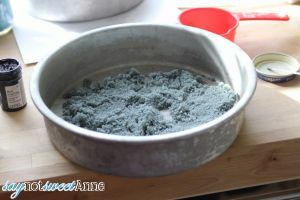 Depending on how much coloring you added, the sugar might be a little too wet to store (unless you like clumpy sugar). If this is the case, lay the sugar out in a shallow pan and put in your oven on 200º. Check it at 5 minute intervals until it feels dry. If it is clumpy, just add it back to the mixer to break up. That’s it! Store your sugar in an air tight container until you need it! Once you start, you’ll find it is hard to stop. I think I made 8-10 colors so far. Two shades of purple, a grey, and brown (which turned out to look just like brown sugar, and therefore might not have been needed.) I’ve got some projects coming up for them – watch out! I could see using this for an afternoon tea. Oh what a cute idea! I never would have thought of that! Kayla, I tried to make purple sugar for my King cake by mixing red and blue food coloring, but it ended up being a yucky brown! Do you have any advice for me for next time? Kayla, I tried using equal amounts of red and blue. It came out muddy-colored with a slight tinge of purple to it. Then I tried adding a little more blue. Started from scratch again and added a little more red. Started all over again, adding a little yellow this time. Nothing seemed to work. I was hoping for a vivid purple. I was using a cheap store brand. Perhaps a better brand of food coloring would make a difference. Yeah, that could be. You could also get a specific color purple icing gel (I use the Wilton brand in craft stores by the cake pans and supplies) that way you know the color it is without mixing! Hello Kayla, I just love your very simple yet effective coloured sugar I will make some to sprinkle over my hot cross buns for Easter and my sweet bread over the weekend. Thank you for posting the idea. Loving your site. 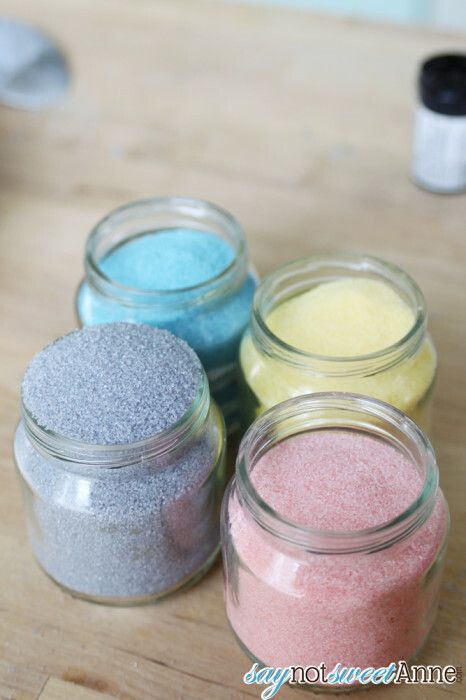 We love making colored sugar too! It’s so easy and FUN! Yours looks fantastic! Such a fabulous tutorial! I can’t wait to try this!! What a great DIY, thank you!! Oh I love this idea! Super fun for Easter. I’m definitely pinning!! I bought different spring colors of sugar to rim the champagne glasses at each table setting for Easter. The result was so pretty! Wish I’d known I could make my own colors for a lot cheaper! Next year I will definitely make my own colors…in fact, I may not wait for Easter–every holiday has a color scheme that would be fun for colored sugars! Oh my goodness, I never thought about it to rim glasses. That would be so upscale and pretty! For years I make spritz cookies and some times I don’t like the color or isn’t what I need for them. this is prefect in a pinch. Thank you for sharing. Pingback: Marshmallow Creepers (Creeps peeps!) DIY Tutorial!